Princesa de Peñasco brings you the amenities that will make your stay, a perfect stay full of comfortability and fun. We have Collin's restaurant with delicious food, happy hour, musical activities and specials during the week. We have a convenience store, volley ball court, 3 swimming pools, a Jacuzzi, club house with fitness area and charcoal BBQ Grills. This one bedroom condominium is a very cozy unit. It is perfect for a small family or a couple. It has been recently renovated and refurnished. You will have a fully equipped kitchen, a lovely dining set for 4 people, and the living room has a sofa set from which one turns into a bed. The bedroom has a queen size bed. The unit has a bathroom with bathtub to relax after a long day at the beach. Also, there is a laundry room with washer and dryer. To go to the patio, you will just have to slide the door open, and you are there, in the beautiful green gardens of Princesa. 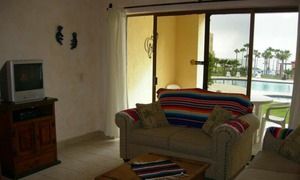 You will also have wireless internet and there are two TV+DVD to enjoy a show or movie. Your unit is in the central building of the resort which means you will have an amazing view of the resort and then the ocean. Enjoy your vacations here, you will be witness to the most fantastic colors of the sunset that only our Sea of Cortez can offer. Sooooooooooooo much fun had a blast place was clean and everyone at this resort were very friendly pools were cold wish they were heated was there before spring breakers and last day is when they started showing up perfect timing but all in all awesome Looking forward for our next visit !! !